Another Kentucky Derby is in the books, and for the third time in four years, Calvin Borel’s name appears in the record. Todd Pletcher finally got his long-elusive Derby win, as did WinStar Farms. 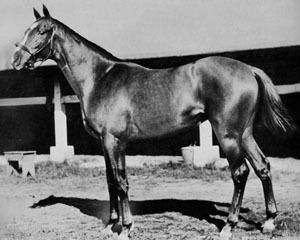 Super Saver became the second son of Maria’s Mon to win the race (after Monarchos, who still ranks as the kindest – and best-behaved – thoroughbred stallion I’ve ever had the good fortune to meet); it was especially notable for the WinStar team as his dam, Supercharger, is a full sister to the dam of Bluegrass Cat, one of their studs. (And for those interested, it is worth noting that Super Saver has a gelding full brother, Hedge Fund, who has earned more than $150,000 – while it took him more than fifty starts, that suggests there’s some good stamina in there somewhere). Without taking anything away from Super Saver’s accomplishment, it is worth noting that while he was certainly lucky to have Churchill Downs resident rail savant on board, he was equally fortunate to avoid some of the trouble other contenders faced. Ice Box’s performance was perhaps the most impressive of any horse in the field; while both he and Lookin At Lucky had terrible trips and acquitted themselves well, under the circumstances, getting up for second was very impressive. But while trainer Nick Zito would like to rest Ice Box with a view toward the Belmont (and later races), owner Robert LaPenta would like to see the colt try the Preakness first. Given the effort Ice Box had to put forth in the Derby, I would side with Zito and wait; the duo still have Jackson Bend, whose Derby effort (while disappointing) likely took a lot less out of him – and the shorter distance seems more of a natural fit for him, while Ice Box seems perfect for the Belmont. Decisions will be made in the coming days. While Borel’s announcement that Super Saver will win the Triple Crown seems somewhat premature (although I’ll give it definite props for eliciting even more personality out of a finally-jubilant Pletcher), I believe he is allowed a little bit of slack, even if winning the Derby is becoming a habit for him. I think Borel took a bit of undeserved criticism for his ride on Mine That Bird in the Belmont – he seemed to have few choices, once the horse had decided to go – but the fact remains that Belmont is not Churchill Downs, and we’ve got another race to get through first. So, who might he face in Baltimore? Noble’s Promise, who was originally being considered for a race at Royal Ascot, may go to the Preakness instead. While it seems clear that he may not want to go a classic distance (and the mile race in England would be a great, if tough spot), he could be well-suited to the Preakness. I’d certainly be intrigued to see him there. Other Derby alumni plotting trips to Baltimore include: Dublin, Paddy O’Prado, Conveyance and Make Music For Me. In the new shooter camp, Caracortado is one of the most interesting possibilities, although there are more than a few. Others under consideration include Northern Giant, Schoolyard Dreams, Hurricane Ike, Aikenite and Pleasant Prince. Two horses I quite like, A Little Warm and Bushwhacked, have both had minor temperatures that have interfered with their training – but they are still possible for the Preakness as well. Of course, much can happen over the next ten days, but one thing seems certain: Team Super Saver will be praying for rain.